Between holiday parties, baking cookies for Santa, and office treats, the holidays can be a time of celebration through food. 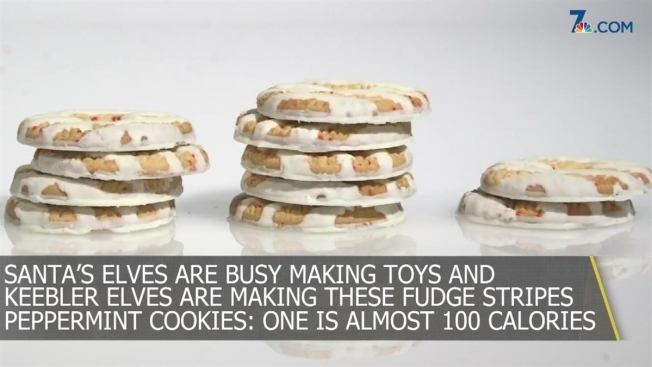 But do you know how many calories you are actually consuming with those holiday snacks? Consumer Reports recently broke down the calorie count in your favorite Christmas cookies, telling you how many to eat to reach 100 calories. For Trader Joe's Dark Chocolate Stars Shortbread cookies, you can eat about three to get to 100 calories. Classic butter cookies, like the ones made by Sherwood Danish Delights that come in the blue tins, come to 100 calories if you eat about two and a third. Pepperidge Farm tops Christmas necessities for some. Their Milano Cookies (Candy Cane version), with layers of peppermint and chocolate, are 100 calories for about one and a half. Gingerbread man cookies from Pepperidge Farm have 100 calories for every three you eat. What about Nabisco Winter Oreos? They have red cream but the flavor is the same. One and a half of those equal 100 calories. Pillsbury Ready to Bake takes a shortcut to decorating cookies. A little less than two come to 100 calories. While Santa's elves are busy making toys, Keebler elves are making Fudge Stripes Peppermint cookies. A little more than one of these equals 100 calories.